Create and maintain DNS records on Cloudflare, secure the communication to the origin servers using certificates from Let’s Encrypt, and how to make this painless and fully automated. Automate, automate, automate! I had a fairly frictionless process for spinning up applications on new domain names, with automatic SSL certificate management. Still, there were a few manual steps at the initial setup, plus not a lot of visibility on the state and progress. Well, no more! One could argue, it’s not too bad, having to do only the DNS registration manually, plus a quick docker kill on an SSH session. It does mean though, that I have to actively participate in, and supervise the launch of services on a new subdomain. All of the 3rd party services and tools I mentioned above have awesome APIs and/or great support for automation. I needed a consistent workflow, involving all of them, executing steps in the right order, and notifying related services as and when needed. Half of the problem with the original process is timing issues, this is what I needed to resolve. This workflow is then repeated on a schedule, so that public IP address changes and certificate renewal happen if they need to. To reiterate, the only manual step in this process is now the git push with the code or configuration changes, like it should be. Yay! On a related note, certbot is actually implemented in Python, but it’s designed to run from the command line with arguments, and that means, it is very difficult to use it as a library. I’m not particularly happy about executing it as an external process, but it is still better than running it on a separate schedule. It was surprisingly easy to get this working, thanks to the awesome open-source libraries available for the 3rd party services and tools. The Docker side of automation is handled by the awesome docker-py library, of course. Cloudflare has a wonderful API, accompanied with a Python SDK. This makes things super easy. The snippet above would fetch the zone details for example.com, list the DNS records, take the first A or AAAA record, and update it with the IP address 8.8.8.8. See? Super easy! certbot is also open-source, as is the underlying acme library that handles requests to the Let’s Encrypt API. certbot’s architecture is modular, and it supports plugins. I used to use the default HTTP-01 challenge, where the tool gave me a token, and I had to serve that up on HTTP, on the domain I was verifying. This was done using Nginx with a shared volume for saving the challenge content, and it was working OK. I found another way that is much better for me though. The DNS-01 challenge needs you to have a TXT DNS record set up with the challenge content, so that Let’s Encrypt can verify your domain by checking it. This is very easy to do on Cloudflare using their APIs. Would I code it up? Absolutely. Do I have to? Nope. The Cloudflare DNS Authenticator plugin is doing exactly this. All I need to do is to make sure the plugin is available. Most of the parameters are pretty self-explanatory. We ask for the specific DNS-01 challenge, agree to the terms of service and pass our email address. The --dns-cloudflare-propagation-seconds 15 flag allows 15 seconds for DNS propagation after the new TXT record is in place, and certbot only starts the verification after this. On completion, either by failing or succeeding, the DNS record is removed by the plugin automatically. Nice one! You pass in your token, the library does the authentication, then you can post as many messages as you wish, within reason. In the Python component, the final task states are collected, along with the standard output and error messages, when available. I’m using the awesome Fluentd logging driver, so the messages will be available in Kibana, in case I have to check what happened. The application logs themselves are also going into Elasticsearch through Fluentd. This is easily done by changing the logging.driver in the stack’s Composefile. 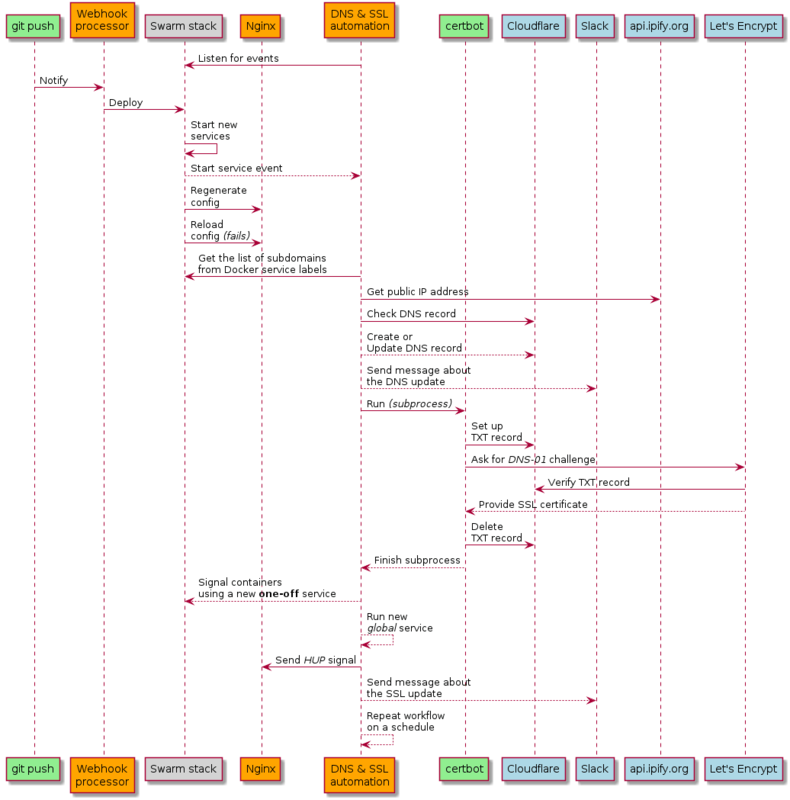 Finally, if you’re more of a visual type of person, this is how the workflow looks like again, drawn using the brilliant PlantUML. I am now testing this tool in my Home Lab, and if all works out, it will replace the ddclient and certbot services, plus the related plumbing, with all the tasks that come with them – a total of 10 containers. It is a nice save of resources, too! I have also started open-sourcing all my Docker stack configuration, starting with the DNS/SSL management stack. Eventually, I want to have them all on GitHub, so its easier to manage, demonstrate and write about them. If you’re checking, don’t worry about the .conf files, the contents are encrypted using git-crypt, which is an awesome tool, doing automatic, transparent encryption and decryption of files that match the patterns defined in the .gitattributes file. You know, for sensitive stuff. Hope you enjoyed this post, and it got you inspired to start building the automation around your own stack. I’m absolutely happy for you to use my app and its Docker image, and I’m also willing to accept pull-requests on the GitHub repo, if all you’re missing is another DNS or SSL management module. If you’re going down these routes and want to get in touch, find me on Twitter @rycus86! A recent Docker update came with a small but important change for service secrets and configs, that enables a much easier way to manage and update them when deploying Swarm stacks. Having looked at the configuration and setup of the services in the Home Lab, it’s time to talk about how we can monitor them, and manage their logs.